Toydle’s founder designed the Toydle fort to be the easiest fort to build – small parts that you can’t lose and no complicated instructions. In fact, you may be surprised to see no instructions when you receive your fort in the mail! That’s very intentional – because there are no special rules, the parts are easy to use, and the kiddos will know exactly how to use the fort when they open it for the first time. 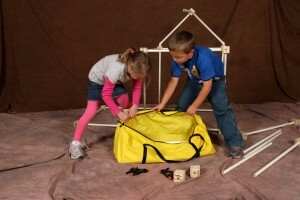 An Oversized Carrying Case to store your Toydle fort after use (remember kids, picking up your fort after play time will make your parents extra proud!). 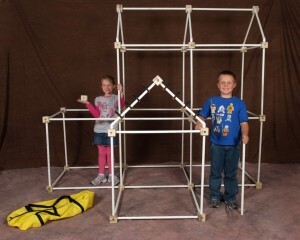 Friendly Wooden Buliding Blocks which will be used along with the PVC tubes to build your fort. Thick Walled PVC Tubing that gets inserted into the wooden building blocks. Extra Large Clips to attach blankets, sheets, comforters or any other covering imaginable to your fort. All you need to do to make your first fort is to insert the PVC tubing into the wooden blocks and create the fort of your dreams. Young children may require the assistance of an adult when inserting the PVC tubing into the wooden building blocks for the first time. Really, we promise, it’s that simple! In order to get used to fort building with Toydle, you might try out a basic fort to start. 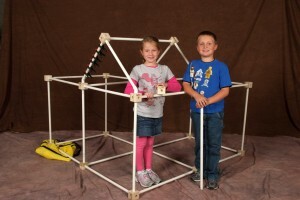 Building a basic fort is as easy as making a cube out of the wooden building blocks and PVC tubes. You can even use some of the curved PVC tubes to make a roof! Once you build your first basic fort, you’re ready to dive in with your imagination and construct your own unique creation. For further ideas on designing forts, check out of other resource pages. 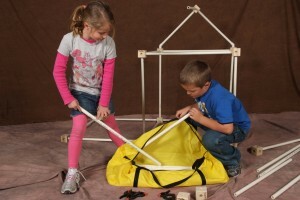 Taking your Toydle fort apart is as easy as building it. All you have to do is twist the PVC tubing while pulling it out of the wooden blocks. Twisting the PVC tubing makes it easy to pull apart. Young children may require the assistance of an adult when removing the PVC tubing from the wooden building blocks. Once it has been disassembled, all of the parts fit into the oversized carry case. Or, because the carrying case is so big, you can use it as a sleeping back for your child! Actually, we’re just joking about the sleeping bag…we wanted to make sure you were still reading!